all you do is have your Node.js app listen on the IPv6 address. UPDATE 28 Jul 2014 – As a result of a Reddit thread I’ve seen traffic to this post. Please do note that I wrote this post in early 2011 when I was experimenting with Node.js. I’ve not kept up with the state of Node.js and so 3 years later there may be new or better ways to do what I’ve listed here. Also, please see the comment from Simon Vetter indicating that you don’t need to start up two servers if you simply use “::” as the address. At some point I need to verify that and then update this post. This will bind to your default network interface and address, which, for pretty much all of us, will be our IPv4 address. With that in place, it’s now answering on both the IPv4 and IPv6 addresses. Now this is for the Node.js base modules… other modules may or may not “just work” for IPv6, too, depending upon what they rely on underneath. 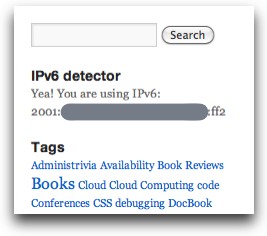 Regardless, it’s rather cool that it works so easily on IPv6. Kudos to the Node.js team for making it so simple! This entry was posted in How Tos, IPv6, Node.js and tagged IPv6, Node.js on January 21, 2011 by Dan York. Testing Node.js With IPv6 – First Step, Does It Work? Given all the writing I’ve been doing lately about IPv6 and about Node.js, it was only natural for me to try combining them. I pay for a VPS over at RapidXen and upon request they will provide you with an IPv6 address block (for free). 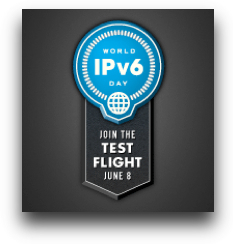 So I’ve been using it as a base for my IPv6 experiments. Oops. Predictably, the console log also did not show a new connection. I duplicated the test to make sure there wasn’t anything else funky going on, but had the same issue. Node.js wasn’t accepting HTTP connections via IPv6. and found that IPv6 connectivity wasn’t supported in the “net” module. Just to verify my testing method, I restarted Apache on the VPS box and used the same “telnet -6” command to hit port 80 on the box. I was able to connect and issue HTTP commands without a problem. But without looking at code diffs, it’s not clear to me what exactly was changed to support IPv6. The next step is obviously to start digging around in code… given that I’m picturing it as a bigger task, I’m not sure when I’ll get the chance to do, but it would be a good excuse to take a look inside the Node.js code. In the meantime, if anyone else reading this has some Node.js modules they’d like me to test with IPv6, or other ideas around this, I’m glad to help. Just drop me a note or hit me on Twitter. UPDATE:The answer that I couldn’t find anywhere online came in a comment to this post from none other than Ryan Dahl… Node.js DOES work with IPv6, provided you give it the address! With that in place, it’s now answering on both the IPv4 and IPv6 addresses! Many thanks, Ryan, for the answer! This entry was posted in IPv6, Node.js and tagged IPv6, Node.js on January 20, 2011 by Dan York. This server has received 5727019 hits from both ipv4 and ipv6.